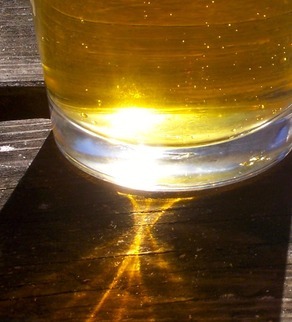 This Friday, December, 5 marks and auspicious occasion for all who enjoy adult beverages. On December 5, 1933, the United States officially ratified the 21st Amendment thereby repealing the Volstead Act and ending the failed experiment of Prohibition for good. 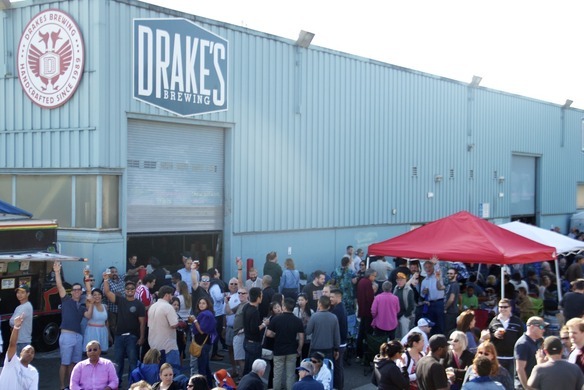 This Friday also happens to be our monthly Drake’s First Friday, in which we at Drake’s show our community all the good that beer can do by raising money for local schools and non-profits. Every month, rain or shine, First Friday gathers a bevy of beer fans together for a good cause, and this month we will celebrate extra in gratitude for our simple right to raise a pint. In honor of the 81st Anniversary of our Constitutional right to beer, we will be kicking off our First Friday event with a special, experimental firkin of our “Repeal Day Rodger” – Jolly Rodger Imperial Coffee Stout with Cacao Nibs and Apricots and collectively hoisting our glasses for toast at 7pm to the heroes that brought down Prohibition. This month’s shindig will be Friday, Dec 5 from 4pm to 8pm, and it’ll benefit theSan Leandro High School Boosters, who will use the funds support San Leandro student athletes so the Pirates can keep dominating on their various courts and fields. Grilled Cheez Guy & Meathead Truck will be here to keep you fed. Yes, we know. Holiday shopping stinks. The malls are crowded and smell like your Aunt Ida’s bad perfume, parking may very well drive you to murder, and online shopping is a crap-shoot at best. It all just makes you really need a beer. If only you could handle your holiday shopping with a beer in hand…. “How?” you ask? 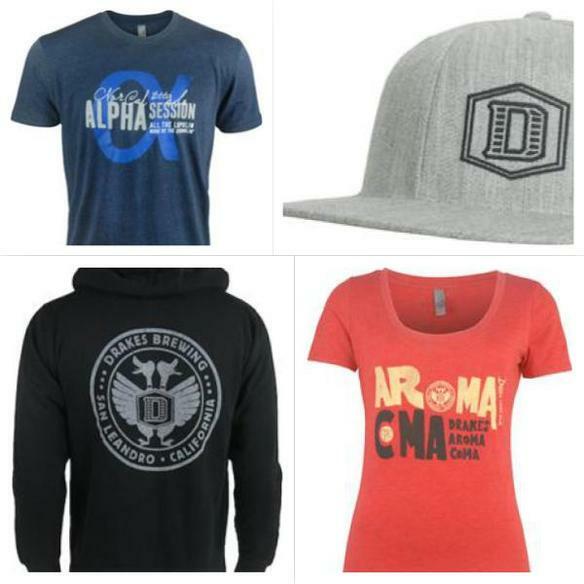 At Drake’s Barrel House you can help yourself to gifts of hats, sweatshirts, t-shirts, glassware, and more for the whole family (trust us your infant nephew will grow into that Denog shirt), all while you enjoy the pleasure of sipping on your own glass of Denog (or one of the 23 other stellar Drake’s beers on tap). Not to mention you can grab your supply of Drake’s beers to go in six-pack, case, bomber, growler, or 5g keg form to get you through the season. Think of the hit you’ll be at your cool friend Tony’s holiday party this year when you roll up with a 5g keg of 1500 Pale Ale. Can’t make it to the Barrel House? 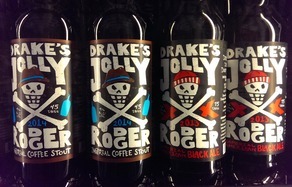 That’s OK. You can still check out Drake’s Webstore for Drake’s merch at DrakesStore.com on your couch while wearing your favorite footie PJs and enjoying a brew from your beer fridge which is always, well-stocked with 1500 and Denog, of course. You have your holiday game plan now. You’re welcome, and happy holidays. Drake’s Barrel House marches on, and is getting better than ever. We already told you about our new fleet of Brew-Rhino kegs, so you’re much more easily able to come grab five gallons of whatever you want from us (no, we don’t have Pliny). Our food trucks are still here every week slingin’ some of the best food you’ll ever have on four wheels (or more). So you can see, we’re not fond of fixing what’s not broken. 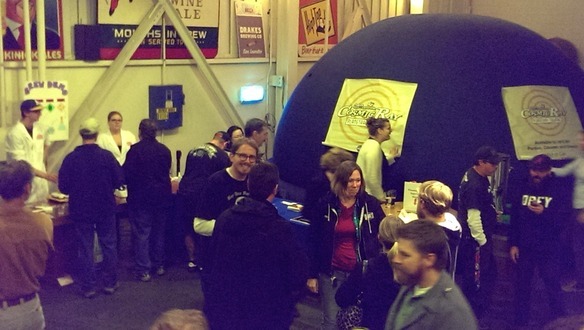 That said, Drake’s Barrel House is dynamic, and new DBH Manager Travis Campbell is runnin’ the joint now, working with Events Coordinator Amanda Cowles bringing in new events & features, like having Chabot Science & Space Center bring in a friggin’ planetarium (shown below) a couple weeks ago, alongside a brewing & yeast demo by our QA team, Mike Spady & Jenna Blair. It’s a little too early to go into the nitty gritty, but there are some significant expansions & upgrades coming to DBH in the coming months & years (like an in-house kitchen we’ll have up & running soon to supplement our weekly food trucks), and as always, we’re happy to be San Leandro’s hometown brewery, and we wanna make DBH your go-to for fresh craft beer in San Leandro. A Date with a Bottle with a Date. We all know there’s just about nothing better than a fresh 1500. But… what does “fresh” even mean? It’s in a bottle, right? You don’t check dates on your Diet Coke or barbecue sauce, why would you for your beer? First off, bottle-wise, we use brown glass. 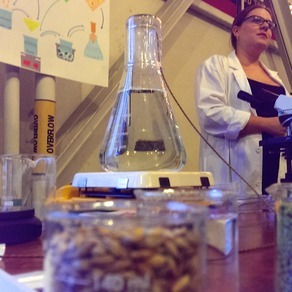 Brown glass keeps out the worst of the UV light that breaks down the alpha acids in hops causing an off-putting skunky flavor and aroma in beer. You’ve probably noticed that just about all craft beer is bottled in brown glass- not green or clear, which don’t protect the beer nearly as well. This also explains why some clear- and green-glassed beers have a tendency to vary wildly from bottle to bottle if they haven’t been stored impeccably after leaving the brewery. (This may also explain the ubiquitousness of potent slices of citrus in the mouths of such bottles.) “I mean, this is the West Coast… we use a lot of hops, and we gotta make sure we’re not wasting all those hops by not packaging the beer properly. There’s no easier way to kill beer than in the packaging process,” Brewmaster John Gillooly tells us. Okay, okay. What’s it all mean, already? Look- we’re spending good money to make this beer, you’re spending good money to drink it, and we both want that beer to be as good as possible when you pop the top of it. Our bottling line takes care of the technical aspects, but your own education is the next biggest step. Buy hoppy beer fresh. In the mood for an IPA? 1500? Denogginizer? 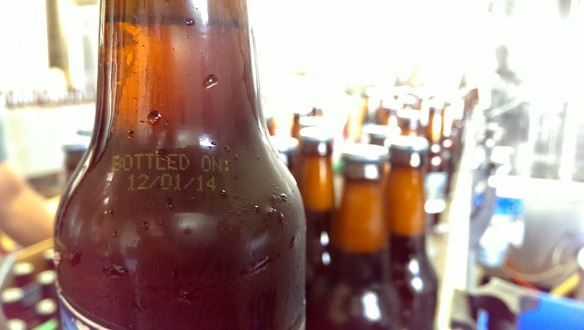 Cool, us too, but look for the date on the bottle to make sure they’re fresh. Doesn’t make sense to buy a hop-forward beer when the hops are all broken down, does it? Now, darker and/or higher-ABV beers are less susceptible to this abuse. Darker beers tend to be lower in hops, so the breakdown of the hops is much less prominent & covered by the malt, and a higher ABV has the side effect of a preservative. That’s why you can see beers like Jolly Rodger and Reunion Barleywine in your local craft beer geek’s cellar, biding its time for a year or five until it’s finally opened. Sours can exhibit a similar fondness for aging- in fact, many sour and other barrel-aged beers fare quite well for years after bottling, and some are even designed to be aged. 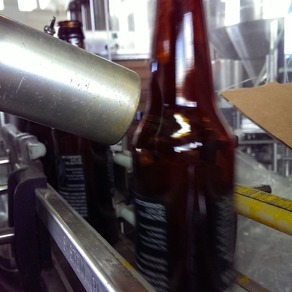 All in all, we’re doing the best we can to make sure the beer is fresh when it gets to you, but the rest is up to you. Are you ready for the Hopocalypse?